After an extremely mild winter — well, at least in Oklahoma — Spring has finally sprung! The sun is up, the sky is blue, it’s beautiful (and so are you!). Drop waist dresses and tunics will be popular again this spring. I love them because their relaxed cuts make them comfortable enough to wear for a long time, whether you’re eating a big meal or moving around a lot. They come in both casual and dressy styles, so there’s a drop-waist piece for everyone. When shopping, look for high quality materials that drape nicely against your body — a thinner polyblend-like material could cling to places you wouldn’t want it to. 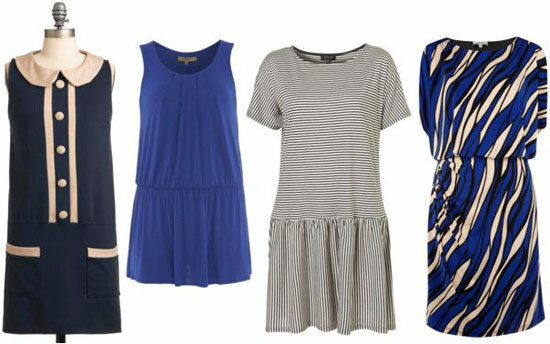 Pair these dresses and tunics with heels or wedges to elongate your legs and balance out the loose cut. 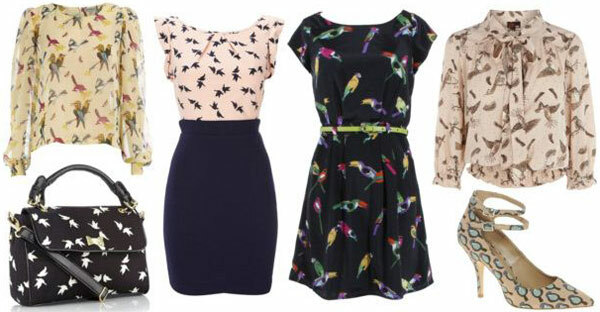 Bird print is an awesome Spring 2012 alternative to floral prints, and adds a quirky edge to any of your outfits. If a bird print dress or shirt is too loud for your liking, look for subtle designs, smaller prints, or bird print accessories instead. 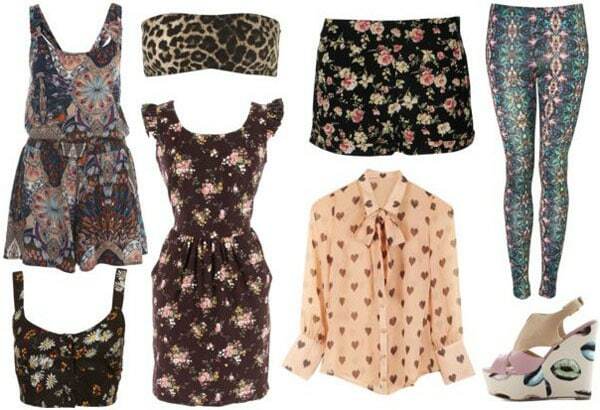 Keep the rest of your outfit really simple to keep the focus on the print! I don’t know about you, but I feel like peplum is the comeback kid of fashion trends — every season, designers showcase it at their runway shows and stores carry tons of pieces, but it never quite takes off assertively. Perhaps after Michelle Williams’ Oscar gown, Spring 2012 will be the season for peplum! Regardless, peplum silhouettes are stylish and unexpected, can be very flattering, and will look awesome when worn with confidence. (And hey, you can probably count on it being the “new trend” for many more seasons to come!). 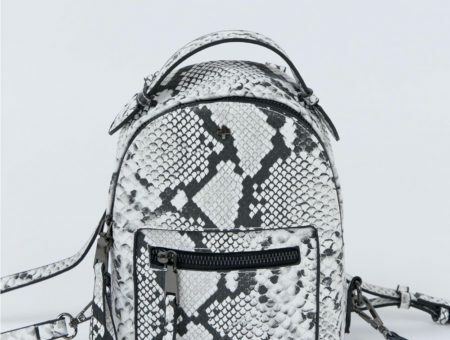 Digitally printed pieces will be popular this season. They are more complex and artsy than patterns we normally see on clothes, thanks to the creativity that digital printing allows for. To rock this look, be sure to keep the rest of your outfit simple, as always! 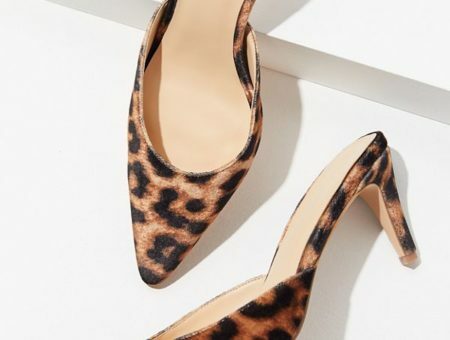 If a dress or pair of pants is too loud for your taste, go for little pops of print, like those on a pair of shoes or a tasteful bralette peaking out under a sheer shirt or loose tank top. Pastels for spring seems like a no-brainer, but unlike the other trends I’ve listed, this trend will look the fashion-forward if you build your entire outfit around pastel pieces: Think pink pants, a light chambray shirt, and light yellow ballet flats. To keep from looking like an Easter egg, add a couple tough-looking accessories to your ensemble — a leather wrap bracelet, menswear-inspired watch, or chunky earrings ought to do the trick. 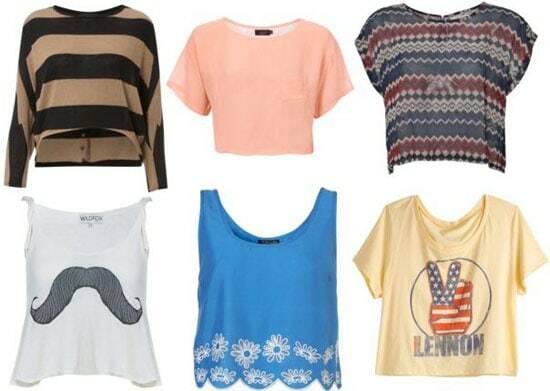 That’s right, cropped tops are back for another go-around. If you’re shy about showing your midsection, try layering a cropped top over a tank top, a dress, or over a pair of high-waisted shorts. Lately I’ve been loving more casual, rock-and-roll type cropped tops, but more structered, girly versions are still hot as well. Which of these trends are you excited to wear this season? Are you excited to see the return of peplum and cropped tops? Which trends do you think will “stick,” and which ones do you think will pass? What other trends are you looking forward to seeing? Leave a comment and tell us what you think! Previous Would You Wear… a Short Suit?